If I write it will they read it? If a tree falls in the forest when no one is nearby does the falling tree make any noise? If a tree falls in the forest is the man wrong anyway? What is the difference between the sound of one tree falling and two trees falling? Do you know because you were there, or do you think you know because someone told you about their experience either in person or through their writings? If you don’t know someone who has experienced something then you are very likely to learn many lessons in hard and painful ways. Unless, or course, you can read about them, understand them and avoid the hard and painful experiences. But to do that, of course, you must make a conscious effort to read and understand what others have written – preferably before you are faced with a situation where prior knowledge would be extremely helpful. Have you read something recently that will help you gain knowledge and wisdom or will you take your chances on being wrong in a critical situation? As I write this in Portland, OR, it is 78°F under a crystal clear blue sky. Yesterday was gorgeous as well and the forecasters promise several more days like this. It definitely feels like summertime is approaching. We’ve already been buying freshly picked strawberries from the roadside stands and the local farmers markets have opened. It’s hard to sit at a computer and work under conditions like this! There will be graduations to attend, early vacations and a host of other mostly outdoor activities coming up over the next few months. Participation in indoor networking events will be down, but the several al fresco events in Portland will be mobbed, even if it’s hot like last year. That’s because we live for the upcoming sunny months. They renew us in spirit, feed our bodies with vitamin D, encourage us to exercise more and just generally improve our moods. There will be street fairs and celebrations that provide sellers with opportunities to bring their wares closer to their customers in convivial atmospheres. More people will be walking in neighborhood business districts and thus more likely to visit retail establishments. Restaurants with outside seating will be making more money well into the evening hours. It really is a wonderful time of year. It’s also time to take a look at your marketing activities to make sure that you capitalize on your opportunities to attract more customers and make more sales. Get that table at the street fair. Hold a sidewalk sale – or two or three at reasonable intervals. Provide gift coupons to your loyal customers for outdoor activities they might enjoy. Perhaps you can partner with other vendors to do this without incurring too much extra expense by cross-promoting each other. Participate in a parade if your town does one. Or sponsor concerts and movies in the parks, a very popular set of events here in Portland. Partner with a local ice cream or frozen yogurt store to do a promotion. Or rent a snow cone machine and the people to run it. Hire a face painter or a professional balloon artist to bring families with children to your establishment. Offer a mid-afternoon “happy hour” if you run a restaurant. Celebrate the summer with your prospects and customers so they remember you fondly in the Fall and during the Winter months. And please share your ideas for summer business promotions with my readers and I. We’d love to hear from you. Enjoy June! 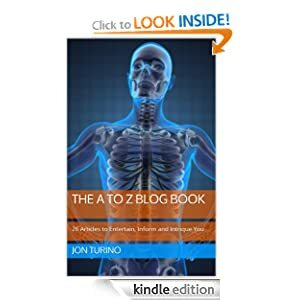 The 2013 A to Z blog posts have been moved to electronic and printed books called The A to Z Blog Book now available on Kindle in electronic form and from Amazon in print form. The Kindle Electronic Version is available at no charge until May 28th. If you act fast you’ll save $3.95. All I ask is that you write a review. You’ll love this book! Order your copies today! The A to Z Blog Book: 26 Articles to Entertain, Inform and Intrigue you. 26 Articles to Entertain, Inform and Intrigue You. Starting with the letter “A” for The Power of the Word “ASK” and ending with the letter “Z” for Zero, Zip, Zilch, this book includes another twenty-four articles ranging from Decisions, Decisions… to Emotions, Empathy and Engagement, KISS — As In Keep It Simple Silly (or other “S” words), The Likeability Factor, How’s Your Perspicacity?, Truth, Trust and Transactions and many more.